Introduction: Single Site Laparospcopy (SSL) is an emerging platform which, which by consolidating working trocar and extraction incision sites, may represent a further decrease in morbidity compared to mult- site traditional laparoscopy (TL). Herein we present a prospective comparison of transperitoneal TL and SSL approaches for laparoscopic Radical Nephrectomy (RN) and Partial Nephrectomy (PN). Methods: Nonrandomized prospective comparison of TL- and SSL-RN and PN. 12 patients underwent SSL (8 SSL-RN/4 SSL-PN) and 18 patients underwent TL (14 TL-RN/4 TL-PN) from 2/2009 to 6/2009. All cases were performed with via a transperitoneal approach. TL-LRN and TL-LPN were performed with a 4 trocar approach. For SS-LRN and SS-LPN, transperitoneal access was obtained through a peri-umbilical incision through which all working trocars were inserted. SSL-RN and SSL-PN recapitulated all the standard steps of TL-RN and TL-PN. Demographic factors, tumor characteristics, peri-operative variables, outcomes and complications were prospectively recorded and analyzed. Results: All 18 TL cases were successfully completed laparoscopically. 11/12 SSL cases were successfully performed without conversion to TL or open surgery, one SSL-PN was converted to open PN for non-progression. There were no significant differences with respect to demographic factors between the two groups. For TL- and SSL-PN: Mean tumor diameter (cm) was 1.7 and 1.8 (p=0.88); mean Ischemia time (min) was 23 and 20 (p=0.81); operative time was 168 and 177 (p=0.77). There were no significant differences with respect to preoperative/postoperative serum creatinine (p=0.88) and estimated Glomerular Filtration Rate (p=0.97). For TL- and SSL-RN: Mean tumor diameter (cm) was 5.0 and 5.3 (p=0.81); mean operative time (min) was 151 and 132 (p=0.37); mean estimated blood loss (mL) was 175 and 100, respectively (p=0.3). 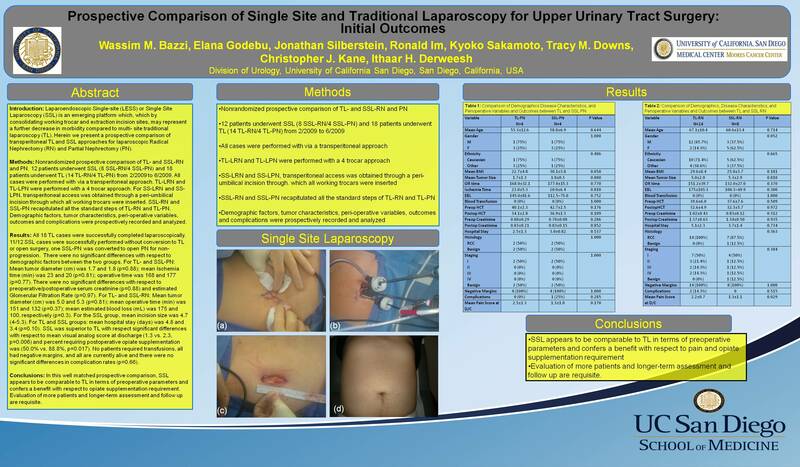 For the SSL group, mean incision size was 4.7 (4-5.3). For TL and SSL groups: mean hospital stay (days) was 4.8 and 3.4 (p=0.10); percent requiring postoperative opiate supplementation was 88.8% and 50.0% (p=0.017). No patients required transfusions, all had negative margins, and all are currently alive and there were no significant differences in complication rates (p=0.66). Conclusions: In this well matched prospective comparison, SSL appears to be comparable to TL in terms of preoperative parameters and confers a benefit with respect to opiate supplementation requirement. Evaluation of more patients and longer-term assessment and follow up are requisite.